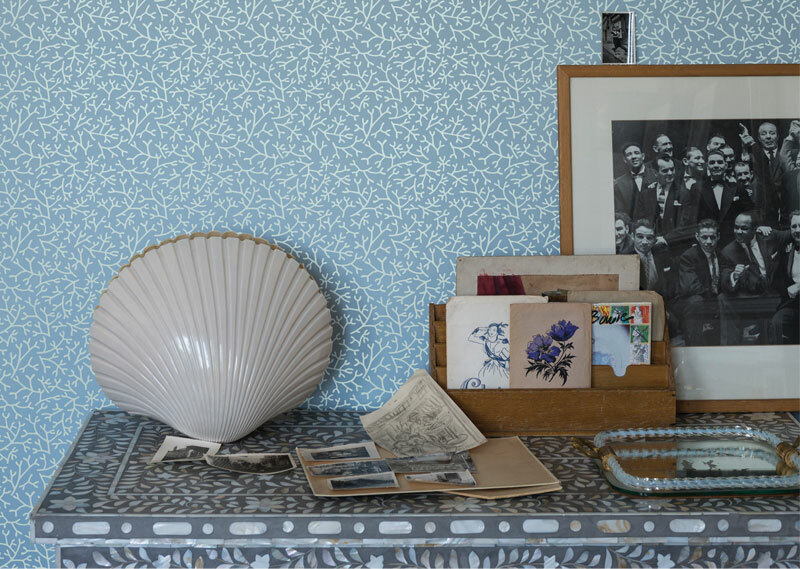 Farrow and Ball has released four new wallpapers for 2014, Jasmine, Chromatic Stripe, Samphire and Parquet all of which have been handcrafted using real paint, giving them a tactile appearance. This is even more evident when you watch the video below of a sheet of Samphire being produced. I think there is something childishly pleasurable in watching the stippled rollers make the pattern. Samphire is an edible plant found along the British coastline, and you can clearly see the inspiration behind Farrow and Ball’s new wallpaper pattern. I think it’s a rather interesting effect and apparently so do F&B, because they’ve chosen it for the current background of their website I notice. I like the Chromatic Stripe and the Jasmine too, but the jury’s out on Parquet. It’s not too bad in the one colourway, but where they have mixed colours to give a stripe, I think it ruins it. But then if we all had the same taste, how boring life would be. Each of the four papers is available in five colourways, from Stiffkey Blue with copper to the more muted hues of Mole’s Breath and Purbeck Stone. For more information visit the Farrow and Ball website.